Public speaking is enough to make anyone sweat. Now imagine condensing months of intensive research into a three-minute presentation and delivering it to a room full of your peers. This summer, 100 Carnegie Mellon University undergraduate students did just that. The students — including participants in the Summer Undergraduate Research Fellowships (SURF); the Dietrich College Honors Fellowship Program; and the Summer Undergraduate Research Experience (SURE) in the College of Engineering sponsored by Larry E. Jennings Jr. and Katherine Jennings — took part in communications modules that culminated in the first ever Speak Up! Communications Session. Hosted by CMU’s Undergraduate Research Office (URO), Speak Up! taught students to express complex ideas clearly and concisely. To do this, URO drew from the expertise of the Department of English, the Dietrich College Dean’s Office, the College of Engineering Office of Undergraduate Studies, the Global Communication Center (GCC) and the Career and Professional Development Center (CPDC). Students like Paloma Sierra appreciated the practice. Sierra, who is majoring in creative and professional writing, used the opportunity to summarize her poetic exploration of national identity and the Puerto Rican diaspora. “I believe the experience has helped me define my research project more effectively so that, besides being able to pitch it as an idea, I also feel more confident while talking about it,” said Sierra. You Bin Maeng is a Dietrich College Honors Fellow majoring in psychology. 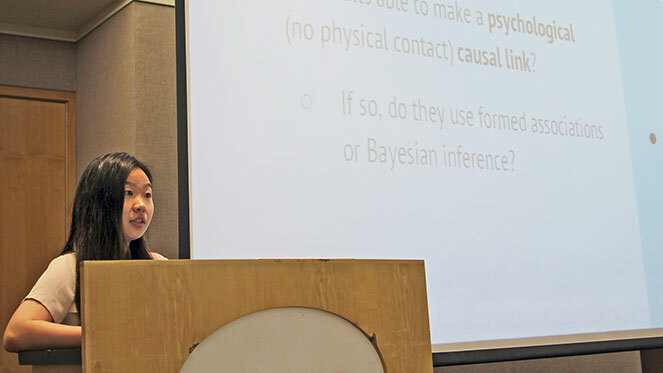 She shared her findings on physical and psychological causal inference in adults. “Before this seminar, I had never really paid so much attention to how well this project may deliver to people who are not in my academic field,” Maeng said. Necia Werner, assistant teaching professor of English, was one of several faculty members who participated in the event. “In the end, the students just blew us all away. They were poised, prepared and professional. All the students have a lot to be proud of,” said Werner. View photos from the Speak Up! session.